Lines For All Occasions. This pocket-sized prompter provides the appropriate (or deliberately inappropriate) script for every encounter. 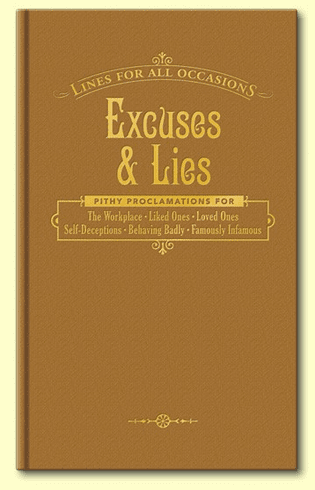 Pithy proclamations for: The Workplace, Liked Ones, Loved Ones, Self-Deceptions, Behaving Badly, and the Famously Infamous. 3 1/2" x 5 3/4"